Gum recession can lead to several problems for dental patients. Quite often receding gums expose the root of a tooth, leading to decay below the gum line. If decay occurs, the tooth can end up needing root canals or even an extraction based on the severity of infection. Gum recession is a problem that not only could cause problems with tooth infections, it can impact the aesthetic look of a person’s smile. Failure to have confidence in your smile can cause psychological problems for many patients. At Arizona Periodontal Group, we are here to help you achieve your best smile! We use pinhole surgical techniques designed to repair gum recession problems and improve your smile. Gum grafting is often used to restore the gums to proper health, but it can be painful. Grafting involves the transfer of gum tissue, stitches, soreness, bleeding, and several weeks of healing. It can be painful to eat and drink for several days following an intense gum grafting procedure. The pinhole surgical technique we use eliminates the need for stitches. Patients often mention the recovery time is faster and less painful. The pinhole surgical technique requires a single pinholes entry points at locations along the under layer of the gums. The skin underneath the gums moves with the gum tissue, allowing us to properly move the gums to fill the areas where you have gum recession. 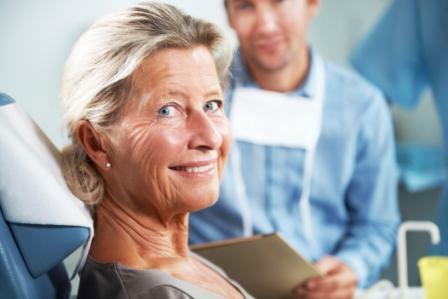 What this means is, we can cover the exposed root of the teeth without major surgery, and we can do it in a single visit to our Arizona dental office. Pinhole surgery has a high success rate and faster recovery time from other periodontal procedures. The recovery period is short-term as the gums heal quickly. The change is the gumline will be noticed in our office once we have completed the procedure. Patients can smile and instantly notice the difference. The small pinhole punctures in the gumline take a day or two to heal. Normally patients experience mild discomfort for the first day following the procedure. If you would like to improve your problems with gum recession and exposed roots, call Arizona Periodontal Group today. We will do an evaluation of your oral health to determine the best procedures to treat your current issues. Most patients are eligible for treatment, unless there are serious health conditions or severe problems that would not allow the treatment to be successful. If you would like more information about the pinhole surgical technique in Phoenix, call our office today!